It’s four days after Christmas, which only means one thing in the world of theatre, panto season, so I was delighted to be in the audience for Manor Operatic Society’s annual pantomine at Sheffield Hall, which this year is the classic fairy tale Sleeping Beauty. The audience were promised thrills, spills and a sprinkling of magic alongside rousing sing-alongs, spectacular dance routines and plenty of audience participation, and Manor Operatic Society more than kept this promise. The professional standard pantomine production offered two and a half hours of a feel good show to audience members of all ages on a winter’s day, and a fantastic introduction to live theatre, musical and comedy for children. The script provided the laughs through a mix of classic laugh out loud jokes and one liners reflecting Sheffield and the surrounding area, alongside lots of interaction with and audience participation, and enough subtle hints at adult humour to keep any grown up happy. Whilst the music was catered for through the show being packed with over 20 classic pop songs and musical numbers sung with fantastic voices throughout and providing the audience with plenty of singalong moments. The opening number “Let Me Entertain You” got the audience in a party mood and showcased the wonderful voices and dance skills of the full cast and chorus, and the choreography of Linda Kelly from the very start, topped off with indoor fireworks. “Desperate Rita” not only introduced the audience to the essential panto dame, Robert Spink as Queen Rita, but provided a great opportunity for the chorus to show off their flamenco dance skills and one of the orchestra’s guitarists flamenco guitar skills. The baking scene wins the award for most interesting use of a Pet Shop Boys song, turning “Go West” into “Lets Bake” before offering interesting kneading techniques that Paul Hollywood probably wouldn’t approve of before I ended up with a raw cheese puff in my lap (along with several other audience members) leading to an audience vs. cast food fight. “One Night Only” was the stand-out number of the show providing an incredible showcase for Emily McGeoch as Witch Carabus cabaret worthy voice before being upstaged by a dragon, voiced by Lee Stott, breathing real smoke and fire. “A Dream is a Wish” let Emma Flanagan as Fairy Winter’s Rogers and Hammerstein/Disney Fairy worthy singing voice shine through in a sweet lullaby. Before, as a massive fan, I loved the sleep walking (pre-singing bench) sequence “Walk 500 Miles”. My standout performances of the night were Emily Mae Hoyland as Princess Primula (aka Sleeping Beauty) who as well as perfecting the perfect stage faint after pricking her finger on a spinning wheel was stunningly beautiful and displayed a perfect pop princess voice (would love to see her playing the lead in Legally Blonde: The Musical); and James Smith as court jester Muddles who not only successfully pulled off the skill of pretending to ride a segway badly but offered a character no audience could resist loving whilst offering the funniest moments of the entire show. Other cast members who deserve a mention include Emma Flanagan, who played the good fairy with a hint of 1950s Doris Day, and who had delightfully mastered her rhyming skills alongside Emily McGeoch, her opposite and the perfect Disney baddie. Lauren Lomas as Silly Sue successfully combined Ab Fab’s Bubbles with a pinch of Benny Hill Show to create the ultimate likable, ditsy, blonde bimbo; and delighting by providing the evening’s slapstick entertainment, as well as leaving the kids in the audience desperate to play the “sweaty socks” game, Chris Hanlon and Andy Finnerty as Pick and Flick. Of course, I can’t review a panto without mentioning the panto dame, and Robert Spink was at his very best during the Bucket Game, chatting to children from the audience at their own level and being completely ease with them even when one of them needed the toilet. In addition to the cast, crew and production team, huge praise must go to the show’s wardrobe mistress Lynn Jackson assisted by Jean Rodgers, Sandra Dunwell and team for providing 100s of costumes, and costume changes throughout for the entire cast and crew. Sleeping Beauty will be delighting audiences of all ages at Sheffield City Hall until Sunday 7th January (no performances from 1st to 3rd January) with ticket prices ranging from £5.50 to £20.00. 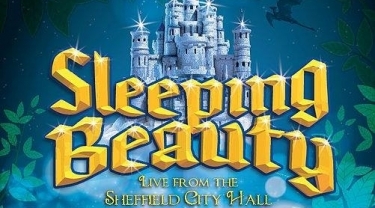 To book visit www.sheffieldcityhall.co.uk/events/Manor-Operatic-Sleeping-Beauty telephone 0114 2789 789 or visit the Sheffield City Hall box office in person. Based in Sheffield, Manor Operatic Society is one of the largest amateur theatre companies in the UK. The society was formed in the 1950’s on Sheffield’s Manor estate, performing their first pantomime at the Montgomery Theatre in 1970 and since 1986 at Sheffield City Hall. They have a cast of over 50 members and now produce the biggest amateur pantomime in England attracting a total audience of over 25,000 each year. For further information visit www.manoroperatic.com. Tickets for Manor Operatic Society’s recently announced 2018 musical Chitty Chitty Bang Bang, at Sheffield City Hall from Wednesday 16 to Saturday 19 May will be on sale soon. For further information visit www.sheffieldcityhall.co.uk/events/Chitty-Chitty-Bang-Bang. P.S. If you have kids I recommend picking up the programme for Sleeping Beauty, which contains a maze, spot the difference and word search competition to keep them occupied during the interval.